Reviewing the flagship product in a company's product line is always a delight. Besides having the best possible features, the flagship product also provides the best possible performance. In the world of Dremel rotary tools this distinction goes to the Dremel 4000. Let's take a look how it performs in our shop, and if it is truly the best tool in the Dremel lineup. 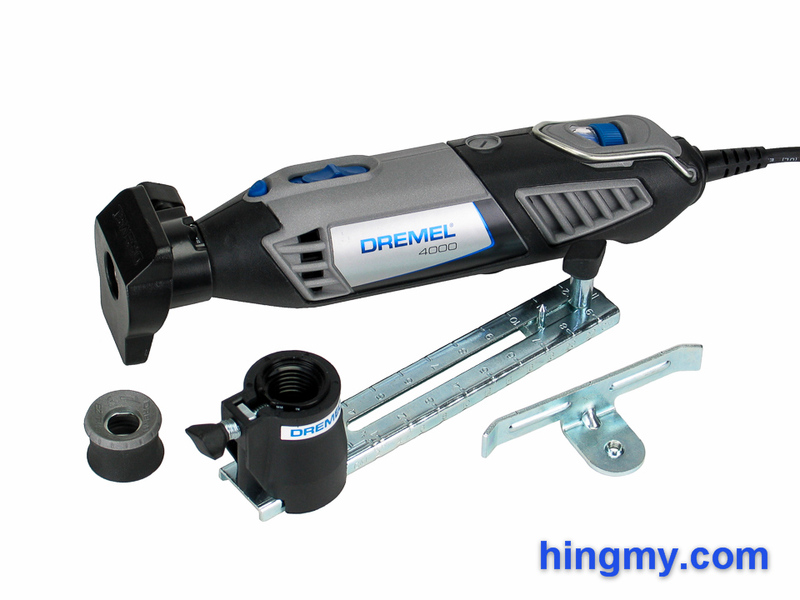 The Dremel 4000 is the top of the line rotary tool in the Dremel line. It has the most powerful motor and best variable speed controls of the bunch. The tool's design, however, matches that of the rest of the Dremel lineup. 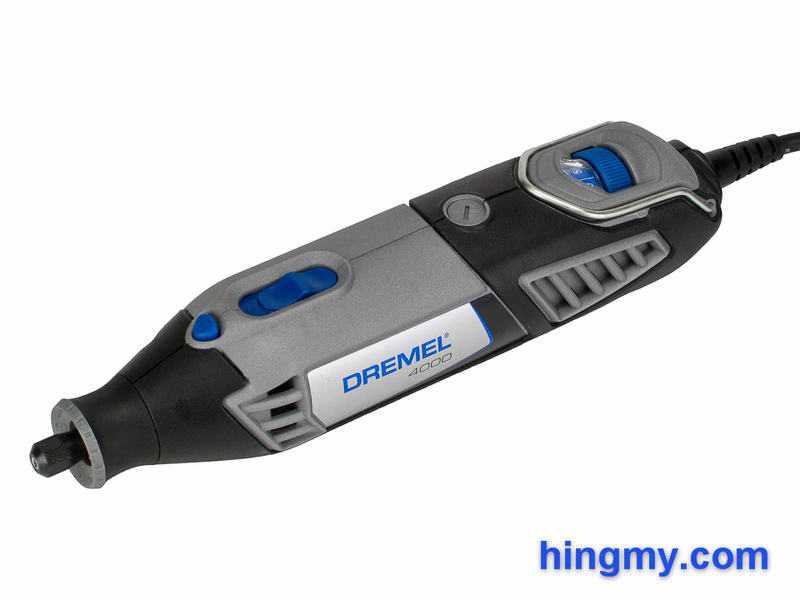 A gray, hard plastic shell covered with black rubber in strategic places gives the Dremel a very durable exterior. Well engineered and put together this tool is likely to last with proper care. Small plastic caps cover the motor brushes for easy maintenance. A hook in the rear of the body allows the tool to be hanged from a hook at the crafting station. This is by far the most convenient way to store a rotary tool. The engineers at Dremel know this and have equipped the Dremel 4000 with a very good hook. Besides being large and easy to use, the hook is also very durable. During use the hook does not change position allowing the tool to be put down the same way it was picked up. 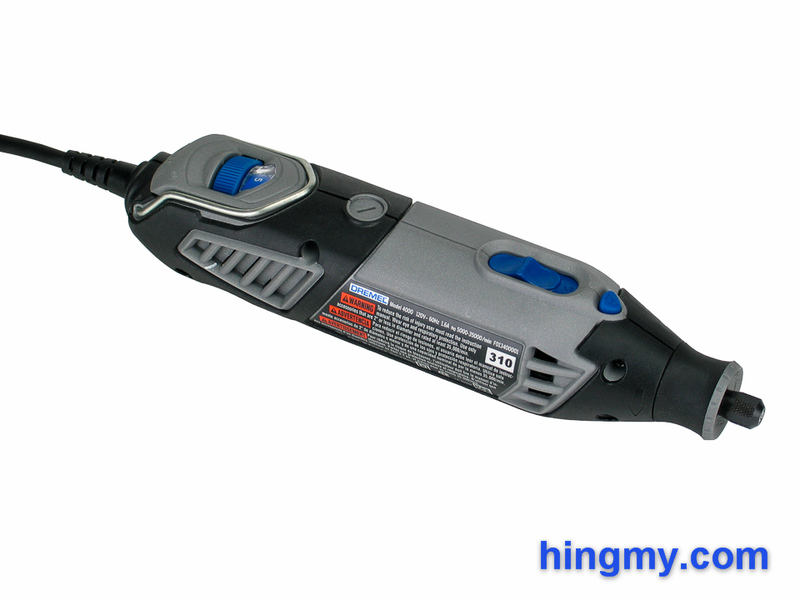 The design of the power switch of the Dremel 4000 is a departure from the standard Dremel design. The Dremel 4000 and 4200 are the only rotary tools in the lineup that have a proper power switch. The other tools use the speed selector switch to turn the tool on. On the Dremel 4000 the motor speed is set using a selector wheel in the rear of the body. The motor's speed can be varied from 5,000 to 35,000 rpm in 22 steps. A separate slider switch near the nose of the tool turns the motor On and Off. This is a big improvement compared to the other Dremels. The variable speed feature of the tool works well. Each setting is distinct from its neighbors. The motor holds a selected speed level quiet well. At higher speeds this is true even under load. The Dremel 4000 along with its variant, the Dremel 4200, is the largest rotary tool in the Dremel lineup. While still having the same pen-like circumference the smaller Dremels have, the 4000 is significantly longer. The motor is bigger and sits further back in the body. When using the tool for pen-style carving, the user's hand has to support a lot more weight further away from the fingers holding the tool. This dynamic makes the Dremel 4000 the least agile of the bunch. It takes more dexterity to achieve the same result with the Dremel 4000 than it does with a smaller die grinder. The Dremel 4000 has the same poor power cord the other Dremels are cursed with. The cord develops kinks easily and does not lie flat. Being packaged for retail is all it takes for the cord to never really straighten out again. When using the tool the cord stays out of the way well enough, but every now and then it gets into your way. Forget putting the tool back into its case at the end of the day. 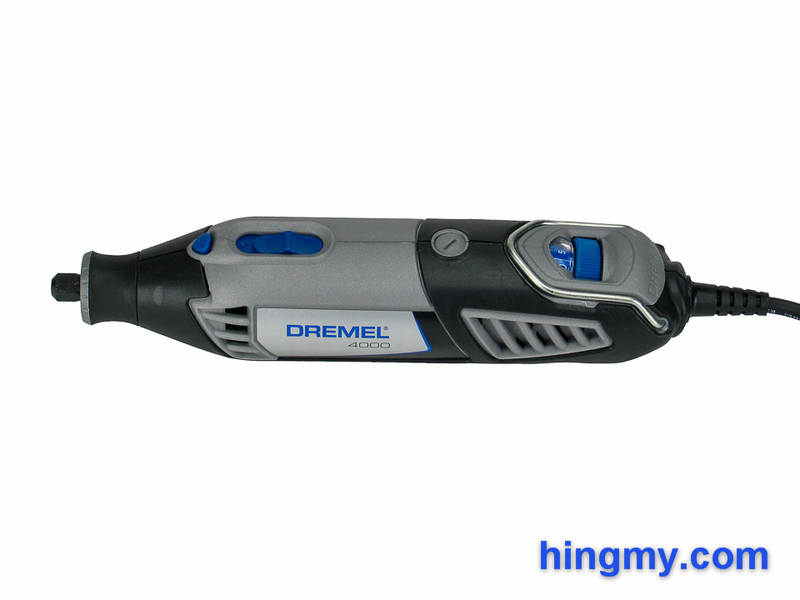 The Dremel 4000 is best kept at the crafting station with the cord uncoiled and ready to go. The Dremel 4000 uses the same 1/8" chuck found on all Dremel rotary tools except the Dremel 4200. A firm grip on the spindle lock button holds the spindle in place, while the operator's other hand opens the chuck with a wrench. The whole process takes only 20 seconds without being in a hurry. The chuck secures all but the largest bits without any slippage. The chuck will only give you trouble when you are pushing the design limits of the tool with very large cutters. The spindle lock button is needlessly small for what it does. It works well, but cannot really be called comfortable. The stamped metal mini-wrench included in the kit is of exceptionally poor quality. Frequent Dremel users would do well purchasing a proper wrench. The Dremel 4000 breaks the trend of poor low speed performance the Dremel line suffers from. While the motor does lose power at lower rpms, the power it does produce is usually enough to complete the task at hand. At 5,000 rpm some users might argue that Dremel 4000 is still underpowered, but at 10,000 rpm few would take that position. Even under heavy load the motor stubbornly refuses to bind and stop turning. At high speeds the Dremel 4000 shows why it is larger than most rotary tools. Cutting and grinding performance is excellent with all bits we tested. Stock removal rates are as good as we have seen them on any rotary tool. If you want something that cuts faster, you have to upgrade to a full-size die grinder. Large jobs are not a problem either. We ran our test model for two hours in our shop making sawdust by the bucket. At the end a slightly warm tip was the only indication the tool had done any work at all. While we did not have the resources to complete a multi-week industrial durability test, it is clear that the Dremel 4000 is built to professional standards. It will complete large projects without any problems. Only heavy users, who use their rotary tool every day for several hours should look elsewhere. The Achilles heel of the otherwise good Dremel 4000 is the way it handles. When doing fine work with an engraver's bit the bulk of the tool is noticeable. It takes considerable skill to balance the weight of the tool while still producing great results. Lighter rotary tools are easier to handle. If you are looking for an engraving tool, the smaller Dremels are easier to use. Depending on your budget, a flex-shaft tool might be the better choice. At high speeds the weight and size of the Dremel 4000 become an advantage. The tool is much more stable than the smaller rotary tools when making rough cuts. Grinding metal and cutting wood are particularly easy to do with this tool. The long body of the Dremel 4000 allows for two-handed use. Operating noise is ear splitting at all speed levels. This is not a tool that can be operated quietly. Proper hearing protection is a necessity. The plastic storage box included in the kit version of the Dremel 4000 is very poor. Made from thick, molded plastic it provides good protection from impacts and keeps the piece of the kit together in one place. Fit&finish, however, is very poor. The plastic latches are likely to break off long before the tool contained in the case goes out of service. Without any interior compartments the box is ill-equipped to handle any attachments and bits you purchase for your tool. They will either not fit in the case, or float around in the case free to bang into everything else. A good tackle box from your local sporting good store is a far better option to organize your rotary tool based hobby. The different models in the Dremel rotary tool lineup primarily differ in the size and the capabilities of their motors. As the model number increase the motor gets more powerful and the number of distinct motor speeds increases. On the negative side the tool gets bigger making each subsequent model less agile than the one before. The Dremel 4000 differs from the Dremel 4200 only in the type of chuck used to secure the bit. The Dremel 4200 has a new keyless chuck that does away with the wrench used on the Dremel 4000. Once the bit is installed, however, the performance of both models is identical. The Dremel 4000 is a powerful, but also very large rotary tool. At high speeds it produces very good results doing rough work. Performance suffers a little at low speed, but is still high enough to make the tool useful. Only frequent users need to look elsewhere. The large size and unusually high weight of the tool are a problem when doing fine work. 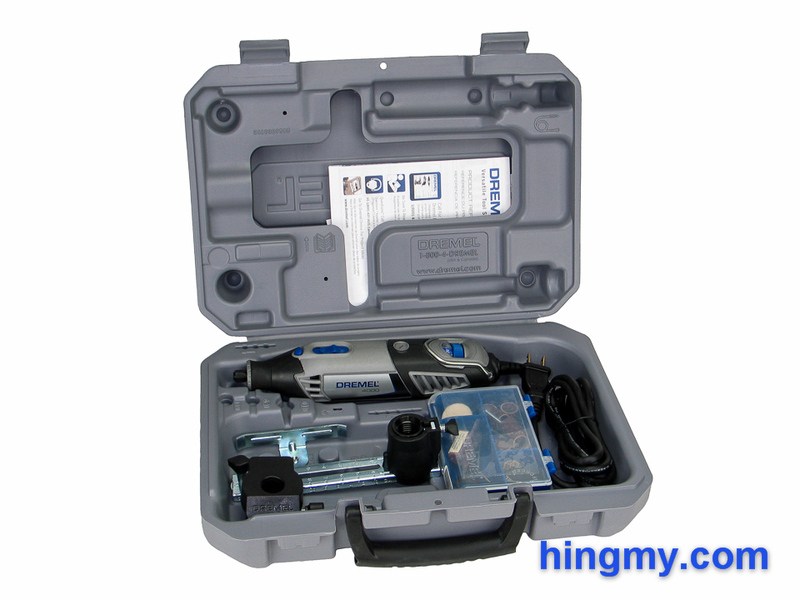 The Dremel 4000 is at the limit of what can be called manageable in pen-style operation. The operator has to spend a considerable amount of attention managing the weight of the tool instead of concentrating on producing better results. The Dremel 4000 lies at the boundary between rotary tools and full-size die grinders. It performs adequately as both, but gets beat by the top tools in their respective categories by a wide margin. The Dremel 4000 is a good buy for infrequent users, who are willing to work around its limitations. Professionals who demand a lot from their tools should look elsewhere.